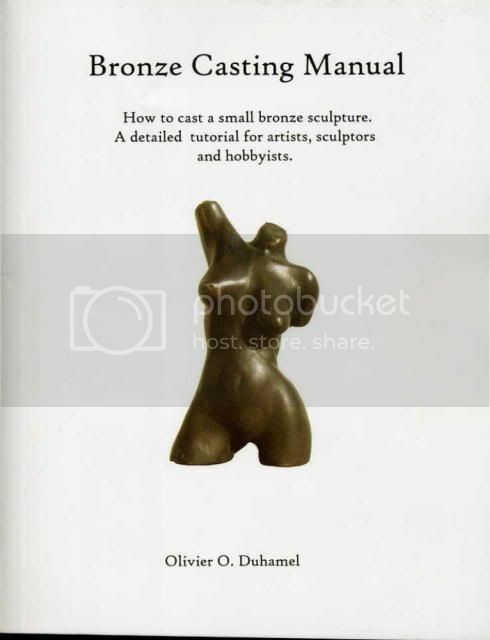 How to cast a small bronze sculpture. A detail tutorial for artist, sculptors and hobbyist. I have to say that in addition to the content/subject of this book, the fact that it was a print on demand book from Amazon. Caused me to order it. This is the new direction that people are taking in getting their work out there with a minimum investment of money. The quality of the book along with the color photo’s is very good. Matter a fact it is better than I was expecting. Plus on the last page it is dated the day that it was printed. Which was interesting. After watching his video on casting some small bronzes, on U tube, the conversion of and successful application of a minimal furnace kiln structure as they do in the pottery field. And the fast easy home made low cost crucibles, along with some of the other aspects of his and his mentors techniques for the waxes models, the thin shell ceramic molds. The simplified, melting, casting, and other procedures. Made it a must read book! I can safely say that by following the information in this book, not only is it low cost, but puts the casting of parts for model engines, shop projects, art projects with in the reach of everybody young or old. From the use of the weed burner torch as a heat source, the koawool (ceramic fiber blanket) furnace shell. To the heavy duty BBQ tongs, welding gloves, face shield. It is one of the best books on the subject and will I’m sure to be come the foundation standard of small time casting in the future. It covers every part of the process starting with the bronze casting itself. Tools, materials and equipment, moving on to aA Project overview and then to Process overview. Before starting gives some tips and into before you jump into the project. Then moving on to the wax sculpting, taking a lot of the mumbo jumbo out of it and giving tips, short cuts and the reasons for doing things this way. He doesn’t just tell you, he tells you his thinking behind doing it this way. A big problem area in the wax model making is sprueing, He goes over the why’s and wherefores of doing it correctly. And the reasons of doing either the top or bottom feed system. Carrying on with making a Wax crucible, Constructing the wax shell, Dewaxing, Reinforcing the shell. Constructing the furnace will change the way people think about small scale metal melting. With a furnace that can be rolled up and stored till the next time it is needed. Baking the shell, melting the metal, and pouring the piece. Chasing and fettling the finished piece and patination of the item, if art work. Then he moves on to the more advanced multiple pieces at one time, larger pieces, Hollow castings, steel handles for larger shells. To advance feeding system designs. Another great part of the book is his Appendices They are for the world in addition to being divide by subject/materials they are divide by country listing and the type of materials, along with websites. It may be light on the tech stuff, but it is heavy on the particle doing of a casting. There was a post and I received an email, about the dangers of the following. It has been brought to my attention, by an email about the dangers of heating kaowool with direct contact of flame. I did some further checking on the email statement, other than the standard warnings about respiratory problems and the use of masks and other safety gear when using a product that started life as a silica material. Blankets,batts, bulk and folded materials. In service this material may see conditions, temperatures greater than 1100'C for extended periods of time, to partially transform the silica present to a complex(disordered) crystalline phase form. If this occurs the precautions associated with the em-brittled fiber material should be followed. You can read the testing results on rats and in vitro with high doses. Should apply to this type of materials.